Video games are a form of media that is peculiar within the world. The very nature of interactive entertainment betrays the idea of art. Art is something that has a concrete purpose or message. Video games do not possess such a thing. SCEA (Sony Computer Entertainment America) released a game in 2001 called �Ico�. This game shook the foundation that a video game could not be art. Everything in the game world was painstakingly rendered in such beauty and detail that a regular Joe would have a hard time distinguishing it from a motion picture. �Ico� is a strange tale. The story is simple and so is the gameplay, but the experience offered is majestic. You, as a gamer or even someone new to games, will enjoy this classic from start to finish. The game opens with a cryptic cinematic. A boy is seen being carried on horseback by knights. They are moving towards some kind of castle. The scenery around them is that of a forest with bright greens and the sun beating upon them. From this moment, �Ico� uses a constant noise of sorts to create an atmosphere that feels desolate. This works to greater effect in later parts of the game, but even the first moment you start playing �Ico�, you will feel like you are one in the world. A title screen pops up after the first cutscene and the gamer is prompted to start their game. After this, the opening continues. Dramatic music sets in (sounds like a choir humming in a very beautiful tone) and the knights are shown taking the young boy up a tower. Every angle of the camera is completely cinematic in nature and rivals a lot of mainstream Hollywood movies in style. The beginning scenes show a great deal of attention to detail in the environment. Birds chirp in the background, waterfalls make their heavy, pounding noises and the chains of the elevator lift sound appropriate. 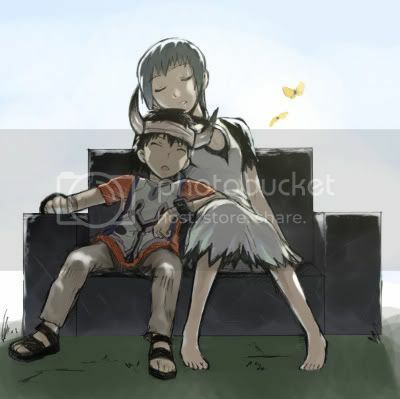 This scene immediately sets a backstory for �Ico� that will be developed later (and even further in the prequel). Something is obviously wrong with the boy. He has horns growing out of his head, which probably indicates some kind of curse or omen to the village he was banished from. All of this is taken in from the first six minutes of gameplay. What else can be taken is the language used. The knights spoke in a tongue that sounded like a mix between Japanese and Latin. This is used to paint the picture of a fantasy world. The young boy, who is referred to as Ico from now on, has an interesting turn of events. His tomb falls from its place in the temple and he is released. The boy has nothing to do but roam the temple, so he makes a trek to the top of a tower in the back. 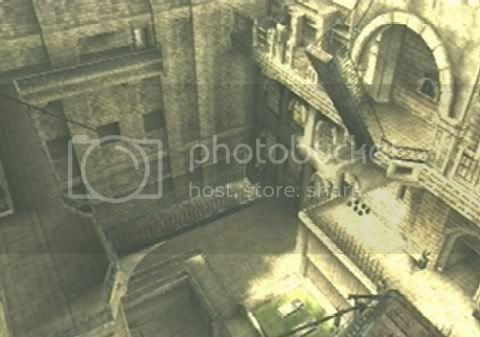 While walking up a winding staircase, Ico notices a cage suspending from the ceiling. In that cage is a girl who is kneeling. Soon, though, her body is consumed by a black mist and Ico is pulled through the wall. The game switches to a type of film grain look while this is happening, causing one to believe this is merely a dream. After this dream, the player is given control of Ico for the first time. Looking around, your only option is to ascend a winding staircase again to look for answers. The scale on which this single area is rendered is quite large. Just as the rest of the game shows, everything in this world is grand in scale. The use of that omnipresent noise in the background and the small stature of Ico create a feeling of being alone. From that first moment you control the game, you almost feel as if the world has given up on the young boy. This temple also produces the games first puzzle and the main focus for the adventure. 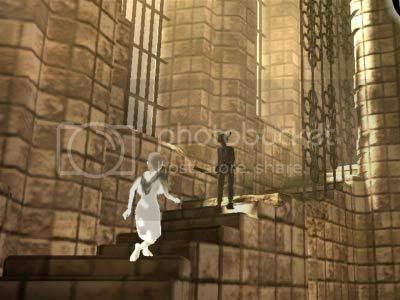 Ico needs to climb a smaller staircase and pull a switch before he can get into the back and find the girl again. When Ico finally reaches the top again, he speaks to the girl. She never responds, but Ico feels that she is being held prisoner. This sends the gamer on a small quest to release her from the cage. Once this task is accomplished, the cage descends to the ground level and Ico finally gets to meet this young girl. He stumbles when she reaches her hand out and she speaks in an even more garbled language than the knights in the beginning. 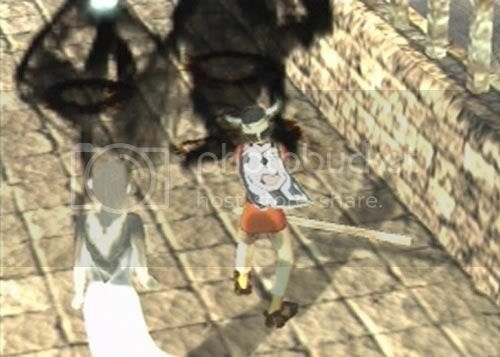 When the girl is mere inches away from Ico�s face, some type of monster appears out of thin air. They pull her away from Ico. The monsters have a style unlike anything seen in modern media. They are creatures made of black mist (similar to what this girl was being consumed by earlier) and have a singular blue eye that glows from their heads. 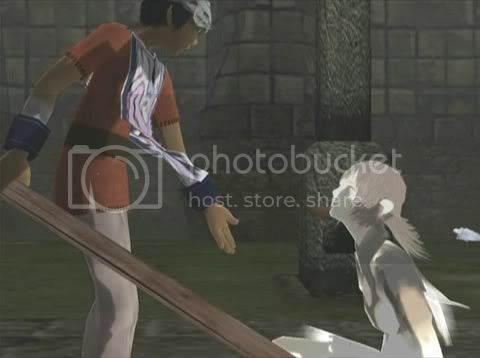 Ico quickly stands up and grabs a wooden plank to fend off the creatures with. This final piece of the intro reveals the rest of the game. �Ico� is about solving puzzles and protecting this girl from the monsters. The story is so simple that one does not need any other explanation. The game falls into place like any excellent book or film with it�s placement of cutscenes that reveal small bits of info and its colossal scale. What does all of this description mean for the artistic side? Some of the best stories of our time are incredibly simple ones where interpretation by the reader/viewer/listener are what makes them art. �Ico� is just that. While a story does exist, nothing more is explained than what is going on (though the prequel provides some background). Not only that, but the characters that the gamer must control are given such life from their realistic animations that you almost feel that you are the adventure. Ico and this young girl (who is later given the name Yorda) help each other throughout the games puzzles in a relationship that feels almost like love. Maybe fascination is what compelled Ico to help Yorda, or possibly his loneliness, but that is all left up to the gamer to decide. When the conclusion of the game does finally come, the gamer feels extremely satisfied at the turn of events. But even before that occurs, the puzzles that obstruct your path need to be tackled. Completing any one of those gives you an overwhelming sense of accomplishment that you feel compelled to sit through everything the game throws at you. If this almost perfect feeling is not art, then I surely do not know what can be. If you want to take a more visual approach, though, this game started many trends with technology that are still used to this day in other games. �Ico� was the first game to incorporate Bloom Lighting techniques. Bloom Lighting is when light is focused on an object so intensively that the object begins to jump off the color spectrum into a white hue. 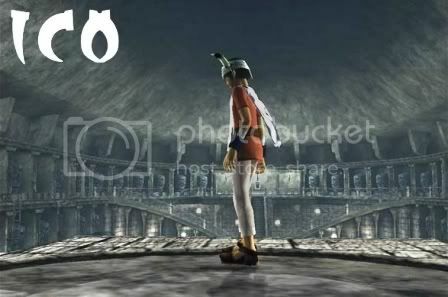 �Ico� also was the first game to use Key Frame Animations, which helped create the extremely realistic movements that the two main characters use. 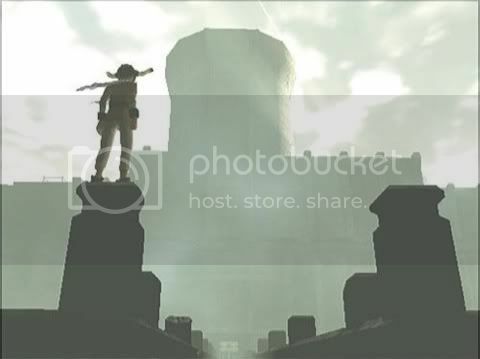 On a gameplay note, �Ico� single-handedly started the renaissance of the Platforming genre. While everyone remembers �Prince of Persia: Sands of Time�, �Ico� was out two years before and did the same exact thing. �Ico� was so influential in this regard that the newest entry in the Prince of Persia series pretty much copied the entire idea of �Ico�. The audio side of �Ico� is probably the most impressive. Video games had used synthesizers for their soundtracks, but �Ico� took a more classical approach and provided music played on cellos and mandolins. The game also took a minimalist approach the dialogue and has very few instances where characters speak. This helped produce the sense of wonder within the story. If a masterpiece cannot exist without flaws, then I do have to point out one thing. Since �Ico� was the first of its kind, the combat mechanics are pretty bad. The game is very simple in nature, so only one button is used for swinging your weapon. While this does become an annoyance during certain parts, the rest of the game is so amazing and well-crafted that I am willing to overlook this blemish. The only other flaw in the game is length. Most people expect a rather long adventure from a title they purchase. �Ico� can easily be completed in around five to eight hours. If you play for the story, however, you will not see this as a flaw at all. There really is nothing else left to say about �Ico�. Not many people have experienced this title, which I have proof of from the extremely lackluster sales figures. The game has sold around 700,000 copies worldwide (and that is counting a re-release in Europe). While the development team certainly had success with their follow-up game (a prequel titled �Shadow of the Colossus�), �Ico� is a game that needs a chance to shine. I encourage every gamer on this site to track down a copy of �Ico�. There probably will never be another game developer that will capture the atmosphere and essence of what �Ico� and its development company have done. What sweetens this deal is that a prequel does exist, so if you are compelled enough to follow the story (who couldn�t be? ), then you can get more out of it. 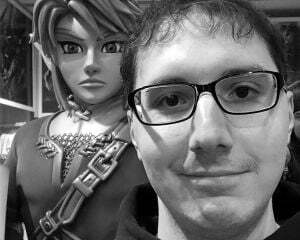 Plucked right from the DToid community (formerly KingSigy), Peter is an aspiring writer with a passion for gaming and fitness. If you can't find him in front of a game, you'll most likely find him pumping iron. Has Gaming Negatively Impacted Me? Check out my Mario Maker profile!